> FULL SERVICE HISTORY (11 services) > MOT to APRIL 2019 (No Advisories) > clear HPI + Mileage check. We have another lovely SL to offer you. This one is a 2006 model so it comes with a slight interior facelift compared to the earlier models, ie comes with upgraded COMAND Sat Nav and Stereo, + other little changes to the facia etc. This is also a 350 model with the bomb proof 3.7 litre V6 not the troublesome newer 3.5 litre engine that was fitted from late 2006 onwards. If you Google M272 Balance Shaft you'll understand why the 3.7litre engine is the one to have. 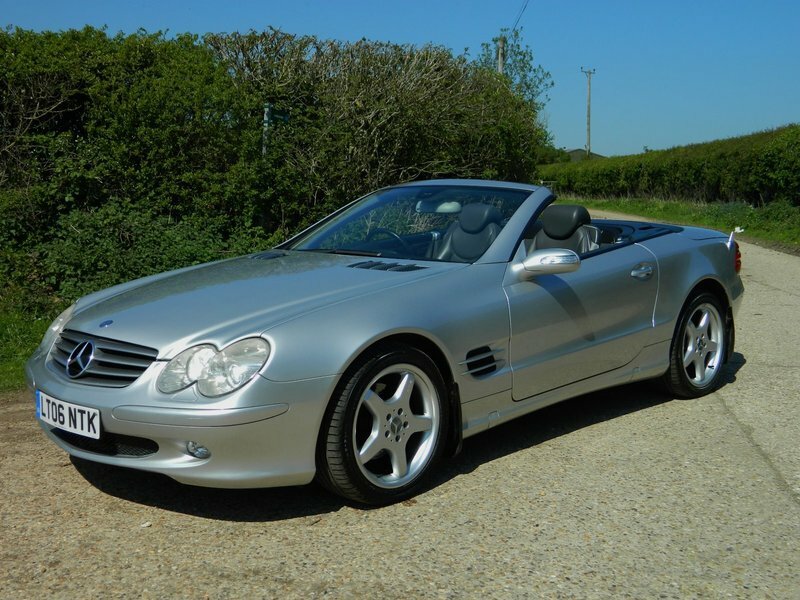 This SL has been very well looked after and comes with a great service history (11 services) and has also just been serviced by our local Mercedes Specialist, Star Motors of Caversham. This car also has a very good MOT history if you look online. Car also comes with a good specification which includes the 18" AMG Alloys, Xenon Headlights, Full Anthracite Leather Interior, Aluminium Trim Inlay, Heated Electric Memory Seats, COMAND Sat Nav/Stereo/CD Changer, Climate Control Air Con, Electric Folding Roof, Cruise Control, On Board Computer, Electric Window and Electric Folding Mirrors, Remote Central Locking, Multi Airbags, ABS, Traction Control, Alarm + Immobiliser etc. This is a lovely car to drive and everything on the car works as it should, ie Roof operation is super smooth and air con is ice cold etc. All in all its a really great example. PLEASE CALL TO ARRANGE AN APPOINTMENT TO VIEW or for further information. Part Exchanges welcomed. This car will come with Warranty and as we are AA Approved Dealers you will also receive a free 12 Month AA Breakdown Policy.